Family run establishment, situated in the quite tourist area of the Island of Ibiza with 16 twin rooms and 1 triple room and 3 rooms for 4 people, climatised bar/lounge; Terrace; Safety Boxes; Internet Facility; Lift to all floors; WIFI in all the rooms and in all the establishment; Snack bar; big screen to follow sport events; Local people atmosphere very friendly open all year; Kitchen open till 12:00p.m; chill out area; tobacco machine; the reception welcome you 24hr, with a free drink on the arrival and in every drink a free 'tapa' (little snack) included in the Price, parking include as well. Check in from 13 hrs (as early as available) and check out at 11am. 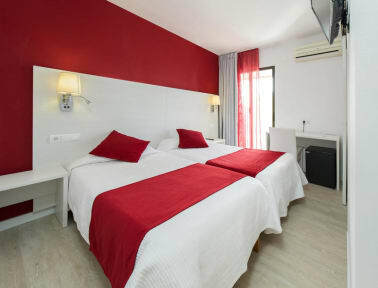 late check out 25 euros per room (till 18 hrs ), after 18 hrs the total Price night would be charged. Courtesy showers for free. Best hostel ever! This was practically a hotel. We were all so impressed with the rooms and the service was unbeatable. I will recommend this hostel to absolutely anyone looking for a cheaper place to stay but with great service! Honestly, way better than I expected. Some reviews say this is not a place for students but the reception desk welcomed us with a shot and a late check-out for free. Decent food, but really good atmosphere and near a lot of local bars. The staff is really nice and kind people. The hotel is in an excellent place and close to the best beaches (it has parking, which is really helpful). Totally recommend this hotel !! This Hostal was amazing. I am used to traveling well with my family but because I am abroad I am traveling with friends and am staying in cheaper locations and this was great. I never write reviews but I was so happy with this experience I wanted to share. The Hostal was so clean and accommodating and comfortable. The location wasn’t the best but the cleanliness made up for it. 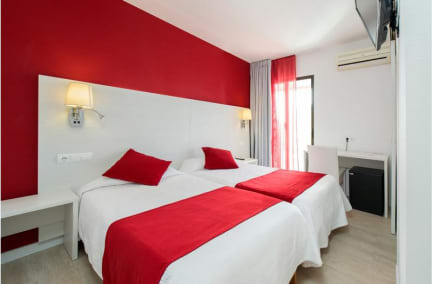 We couldn’t have asked for a better place to stay in Ibiza it was affordable, very clean, comfy beds and the best staff. The Owner was so kind and helpful he showed us the best places to go and held on to our room keys during the day. Very safe part of town and short walk to everything. I highly recommend to anyone thinking about Ibiza you can’t beat this place! Good overall, the room was small but worth the money. The bathroom was clean overall despite the strong smell of disinfectant.